Waxed Canvas and Leather Bags – Fashion’s most useful revival? 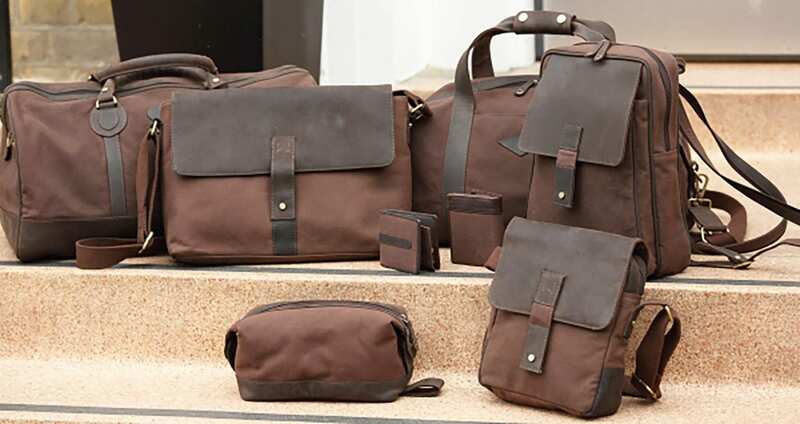 When it comes to bags, waxed canvas is nothing new, and as one of the oldest materials in the world, it could be said that it has indeed stood the true test of time. So what exactly is waxed canvas? And why is it making something of a revival as one of the current must have fabrics when it comes to bags? The roots of the waxed canvas industry can be tied to the history of clipper ships in the early 1800’s. Sailors used to sew together scraps of sails that had been damaged, before rubbing them with linseed oil and using the resulting cloth to fashioned rough waterproof ponchos to protect themselves from all the harsh weather conditions they encountered at sea. By the mid-19th century a Scottish mill, which was already in business making sails for the British fleet, began to make sails impregnated with linseed oil for new fleets of fast moving clipper ships. This new waxed canvas replaced the flax sails that had been used previously, not only was it significantly more waterproof in heavy gales but the sails were also stronger and more lightweight. The versatility of the waxed fabric soon spread to other uses and both fisherman and sailors were able to take full advantage of its waterproof properties that enabled them to do their jobs more effectively in wet weather. Fast-forward to the 1930’s and the linseed oil, which with age began to crack and harden, rendering it useless, were replaced with paraffin wax. Waxed canvas was no longer just the cloth of the seafaring workers, its popularity spread to farmers and those who worked outdoors, not just in the UK but also as far away as New Zealand and America. During World War 2 it gained favour with the military making it the clothing fabric of choice for the British armed forces. Trivia fact: During WWII the British armed forces were the only military body that was kitted out with waterproof clothing. There are just two main suppliers of waxed canvas today, one in the UK and the other in the US, and while others have tried to replicate the fabric, it’s been hard for them to produce the same fantastic quality. Whilst companies like J Barbour & Sons, maker of those all too famous green waxed jackets frequently worn by the queen, and Belstaff, who manufacture motorcycle clothing, have been using waxed canvas for many years, the fabric is currently enjoying something of a revival in both the clothing and bag industry, where it is paired with leather to produce some visually simple but stunning items. They do say that the type of bag you choose says a lot about you, and how you carry it says even more. However, whether you are a ‘hide behind a cross body bag’ type of person or a ‘backpacks at dawn’ kind of girl, here are just a few fantastic examples of some of the top trend bags for this autumn and winter season. This waxed canvas and leather crossbody bag from the new range at Wombat Leather is the perfect example of one of this season’s must-haves, effortlessly complimenting the ideas of adventure and relaxation portrayed on the catwalk recently. At 22 by 27 centimetres, this bag is the perfect size – just big enough for all of life’s little essentials without being too bulky. The stylish design incorporates thick, durable water resistant waxed canvas and premium thick oiled Nappa leather. With plenty of zipped pockets, both inside and out this bag is as practical as it is stylish. And with extra details like the rich red-orange cotton of the lining, solid zinc brass hardware and practical canvas shoulder strap, which is adjustable it understated elegance is sure to be a winner with everyone. Rucksacks are another of this season’s on-trend bags, although, in a twist to the usual style of carrying them on the back in true backpack fashion, they are being carried by the grab handle swinging casually by the side. Whichever way you prefer to carry yours, whether you are old school, or truly fashionable then this Waxed Canvas and Leather Rucksack is the perfect accessory. Beneath the sturdy canvas and leather of this little number lies a surprisingly roomy, yet lightweight bag. With two zips to keep all your bits and bobs secure, two fully adjustable straps and of course that very important carry handle. This is truly a chic little number. No wardrobe is ever truly complete without a trusty duffle bag for those impromptu weekend getaways, and here we display the perfect little number, perfect for anything from festivals to spa weekends. This Waxed Canvas and Leather Duffle Bag is just the right size to contain everything you should need for a weekend getaway. With its classic holdall style, a durable water resistant waxed canvas, and soft Nappa leather, we’re sure this will be the holdall you reach for every time. Its simple, understated elegance is complimented by a number of practical features such as solid zinc brass feet, which will help to keep the base of the bag scuff free and in fantastic condition and the adjustable and detachable thick canvas shoulder strap that can be used instead of the leather handles should you wish. Like the other bags in the new collection, this stunning little holdall also features the same vibrant red-orange cotton lining. The great thing about any of these classic styles of bag is that the classics stand the test of time – fashions come and go but classics are always just that. The right bag can last you a very long time, so look after your bag well, brush off any dirt, sponge clean gently and thoroughly air dry before storing away, and it is sure to give you many, many seasons of use.